Are you looking for more than just a great coffee? Portland, Oregon known for its quaint and quirky places does not leave restaurants out of this equation. Today there are chapels, schools, and coffee shops converted into tasty cafes and restaurants. One rising star is Coquine, a local coffee shop turned gourmet café. Belly up to the bar and place your order for some amazing farm to table seasonal food. 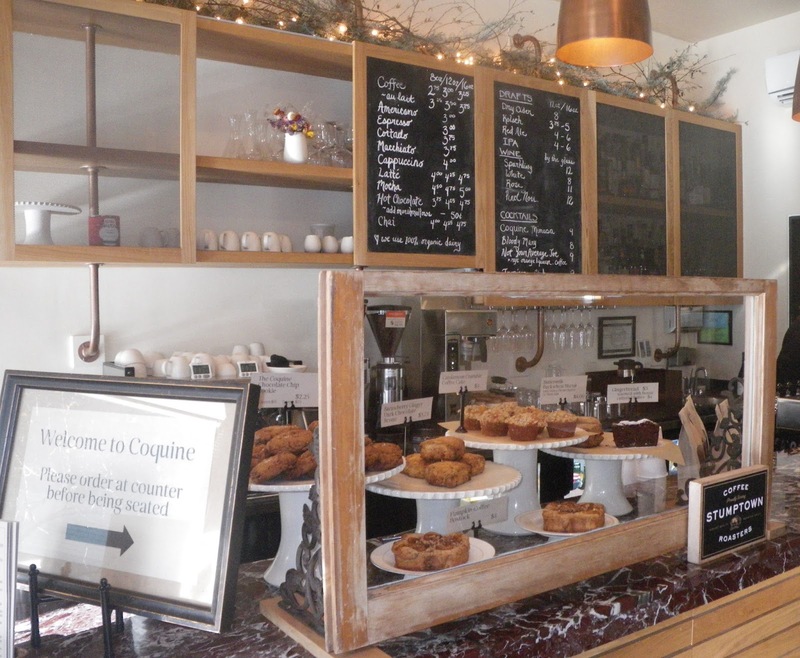 With sparse décor, earth toned tapestries and a coffee shop feel you can enjoy breakfast, lunch or dinner at Coquine. While famous in Portland for their smoked almond, salted caramel, chocolate chip cookies, you can dine on amazing food before satisfying your sweet tooth with dessert. Recently, I shared a winter lunch with my friend Cheryl Padula, owner of Bateaux winery in Toledo. We went full force and ordered Coquine’s Perfect lunch for two. Lunch included a savory kale salad tossed in tahini-yogurt dressing, our choice of two sandwiches, corona beans, two cookies, and the most amazing pumpkin soup I have ever had. To wash down the meal the waitress delivered a bottle of Maylandie Rose to our table. A Trained and Avid Foodie. As a graduate of a small culinary school in San Francisco, I consider myself an educated and experienced food connoisseur. Everything we had for lunch that day was delicious, but the soup…oh the soup. I have certainly eaten and created my share of pumpkin soups, but after experiencing Chef Katy Millard’s nothing else compares. This soup was smooth sweet perfection, topped with brown butter croutons and pepitas providing a needed crunch. While savoring the soup, I detected back notes of cheese. Maybe it was a rind of Parmigiano-Reggiano steeped in the broth during the cooking process. After discussing the matter with Cheryl, I asked the waitress if she knew the secret. She revealed that a cheese known as Mimolette was a key ingredient in the soup. Where Can I Find this Unknown Cheese? Portland supports many artisanal shops. Two days after our lunch, I decided to check out Cheese Bar located down the street from Coquine at 6031 SE Belmont. As fate would have it they did carry Mimolette cheese. I purchased a wedge and went home ready to make the delicious soup. I have to say mine turned out great, but I still give chef Millard first prize. Each segment of our lunch was enjoyable. Take my advice before the weather warms up and head over to Coquine, order a bowl of the amazing pumpkin soup, and don’t leave without a few of their famous cookies. Coquine is located at the top of Mt. Tabor, at SE 69th and Belmont in Portland, Oregon.